a) Based on the fact that Giger was a J G Ballard fan, he would have referenced some of Ballard's work in various ways in his paintings. One might assume that he referenced ideas from the novels in his work or perhaps the covers of some of the books in a similar way that he would come to reference Tomita album covers in his work. 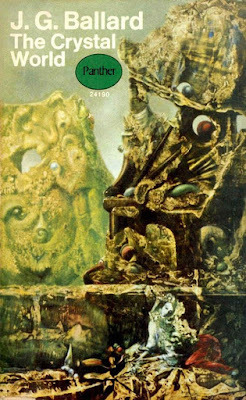 But I'm led to understand that it wouldn't be so easy to say how Ballard's novels got into Giger's paintings. On the 16th November 2016, I make a connection between Giger's art and a Ballard book cover. b) Since there have been a number of covers to choose from for the various books, he might have decided to base paintings on covers he liked rather than just any old cover. 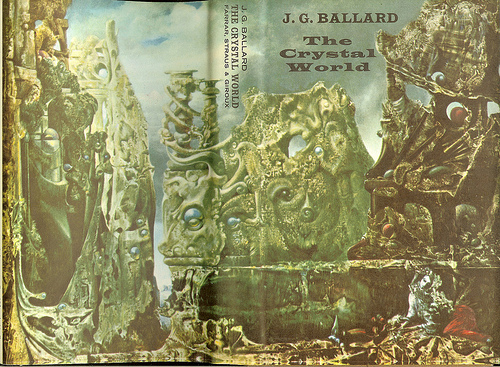 Looking for covers reveals an interesting Max Ernst painting called Eye of Silence used for the 1968 edition of Ballard's The Crystal World. c) I'm wondering what the Giger painting could have been and about formations in Lord of the Ring II by Giger from 1975. 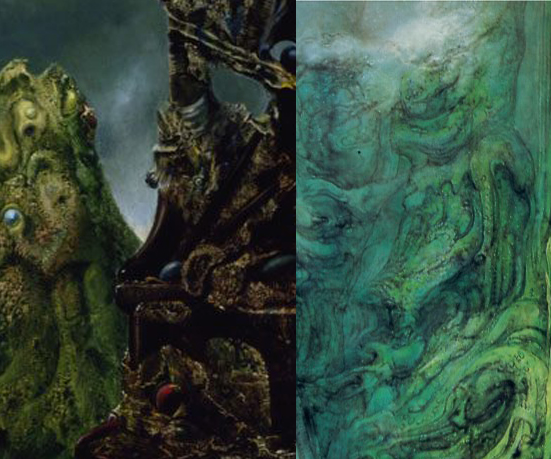 The strange green painting features a giant tumerous formation that's merged with something that looks like an engine or a complicated brass instrument, surrounded by pipe covered cliff faces. Apart from the greenness and odd cutaway gapes at the top of the rock face, starting to notice slightest similarities so slight that one might as well forget about making any comparison between the two. Still, the vague similarities can be appreciated. d) vague similarity in a vague suggestion of a profile of a face with another profile of a face above it. e) reclining female in red dress in Ernst's painting and the Giger version of this. 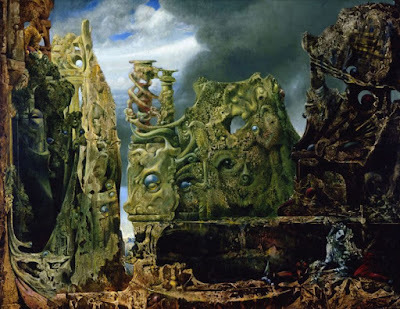 Well, I have to say that perhaps I don't know what the painting is really about other than Giger's transformation of a Max Ernst landscape as far as his imagination could take it, and so it was something he was happy to explore in a painting and create something that was different. Perhaps what he turned out in the painting came to him as an idea without having much to say about it. There might well be more things for me to realise about the painting that I just haven't come to terms with. I like the upper central flowing shapes and forms of the cliff, as if they're the smokey remains of huddled people gathering around this central form. 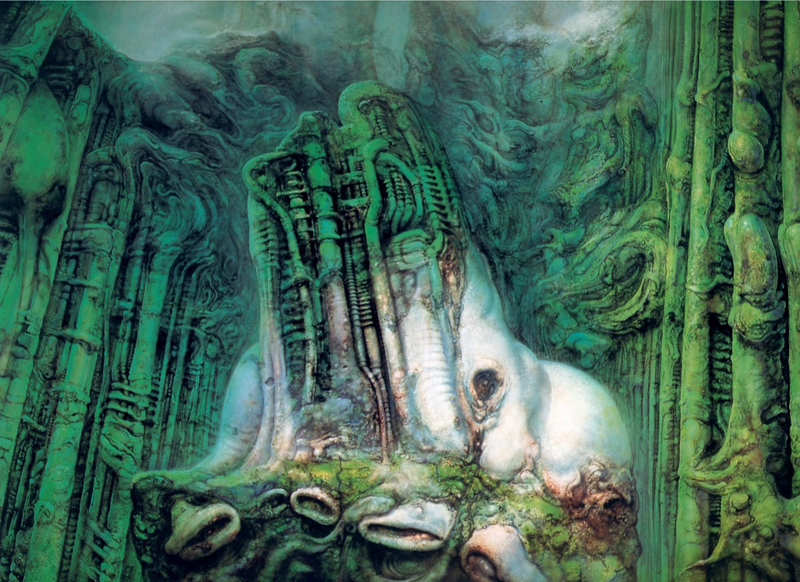 I assume that there's another painting or two that Giger referenced and I might one days work out what. At the moment, I still haven't had much to say about Lord of the Rings I either. That one seems to have impressions of mutated figures transforming into the landscape. I think that Giger has occasionally painted things buried in his paintings that have some connection with ideas and imagery from the Tolkien books but nothing specific in these. He liked given the name of the book to them though, perhaps there is some sort of emotional connection with imagery of landscapes from the books though. I might wonder if those paintings might have been highly imaginative semi-reinterpretations of local gorges or cave complexes that he knew of.